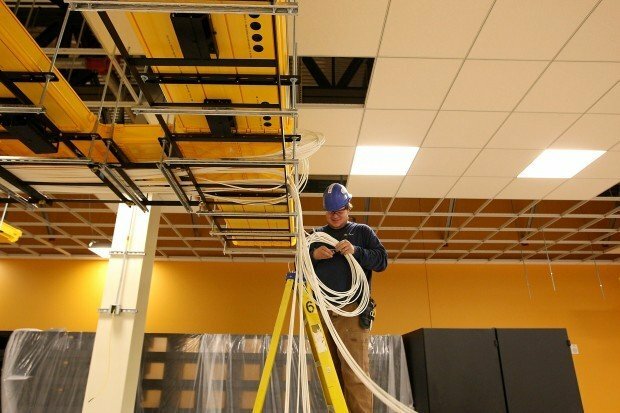 Roger Pone with the telecom company Linx, out of Denver, works on wiring at the new NCAR-Wyoming Supercomputing Center in Cheyenne on Friday morning. Media tours were held to show how construction is coming along and answer questions on the facility. The building is expected to open in the summer of 2012. Construction continues on the new NCAR-Wyoming Supercomputing Center in Cheyenne on Friday. The facility conducted a tour for members of the media to show off the facility, which will open in the summer of 2012. Members of the media and guests tour the new NCAR-Wyoming Supercomputing Center in Cheyenne on Friday. 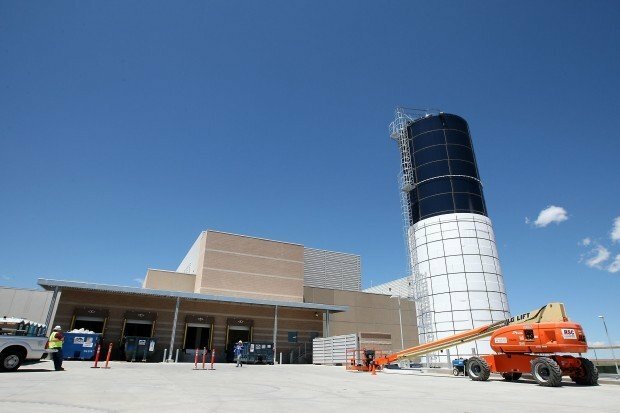 ﻿CHEYENNE — On a grassy plain on the eastern outskirts of the capital city, construction is proceeding smoothly on a massive new home for one of the world’s fastest supercomputers that may soon yield big benefits for science, Wyoming and humanity. When completed next spring, the facility will help answer some of science’s most fundamental, yet most complex questions about weather, from discovering how and why hurricanes and tornadoes form to predicting the effects of global warming on Wyoming and other parts of the world. During a tour along the imposing concrete rooms and hallways of the half-completed 153,000-square-foot facility on Friday, National Center for Atmospheric Research officials explained how the building itself will be as state of the art as the computers it will house. It certainly will be one of the world’s most energy-efficient supercomputing facilities. One main reason NCAR chose Cheyenne over two Colorado locations for the new facility is the area’s climate: For much of the year dry, cool air will be pumped in from outside to keep the supercomputer from overheating without any need for energy-thirsty air-conditioning systems. Water from a 140,000-gallon tank will also be circulated throughout the building to keep the supercomputer cool. After being warmed by the computers, the water can then help heat the building in the winter or be pumped back in the tank for recirculation. “[The water tank] acts like a big battery for cooling,” said Aaron Andersen, the project engineer for the facility’s design and construction effort. The supercomputer itself won’t be purchased until this fall. While the exact speed of the computer won’t be known until then, the facility is designed to support a one petaflop supercomputer (a petaflop is equal to one quadrillion — 1,000,000,000,000,000 — computer operations per second). Andersen said once the facility comes on line, it will pay immediate scientific dividends, such as understanding more about severe storm systems and developing more accurate and more long-term weather forecasting models. “It will enable the computer to be sort of the analogy to the Hubble telescope, enabling us to look at the atmosphere and the earth’s system with a resolution and fidelity that we could never do before,” said Rick Anthes, president of the University Corporation for Atmospheric Research, which manages NCAR. In addition, the facility is designed to expand and grow as computers get faster. Additional cooling systems and electrical feeds are being installed in anticipation of new technologies that haven’t even been invented yet. “We’re trying to think far ahead in developing this center, so that it will last and serve science and society for well beyond 25 years from now,” Anthes said. To bring the supercomputing facility to Wyoming, the state provided $20 million toward construction costs. The University of Wyoming will also provide $1 million annually for the next 20 years for computing upgrades. The NCAR facility itself will only create 10 or so new jobs in Wyoming; 10 to 15 current NCAR personnel will also be transferred to Cheyenne from Colorado. But state officials say the new supercomputer will almost overnight put the University of Wyoming and southeast Wyoming on the map in the world of computer technology. approved. That’s because in exchange for the state’s funding, UW will have access to 20 percent of the new supercomputer’s operations. Gov. Matt Mead said Friday he believes the new facility will also help to lure private high-tech companies to the state. “To be able to say you have one of the fastest computers in the world in your backyard in Wyoming is a great message,” he said. CHEYENNE — Starting next summer, University of Wyoming students and researchers will have access to one of the world’s fastest supercomputers. LARAMIE — A supercomputer destined for Cheyenne could someday help wind farm developers figure out the best places to put their turbines in Wyoming.